Profile: The world's third largest software company, Computer Sciences Corporation, commissioned a pair of six-story office buildings on crucial real estate next to Lady Bird Lake in downtown Austin. 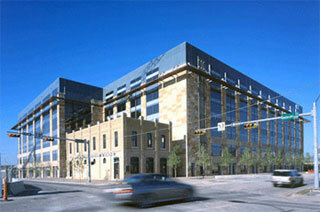 The two buildings, standing east and west of Austin's new City Hall, frame the southern entrance into the vibrant downtown. The project included the design of 20,000 SF Data Center within the two corporate office buildings to support computer labs, engineering support systems, conferencing centers, and administrative offices. Infrastructure design is a standards based system that supports high-speed Ethernet to the desktop and wireless applications. Services: DataCom Design provided design solutions for IT, audiovisual, and security, which included a standards-based system supporting Gigabit Ethernet to the desktop and a wireless overlay in specific departments to support a flexible environment.